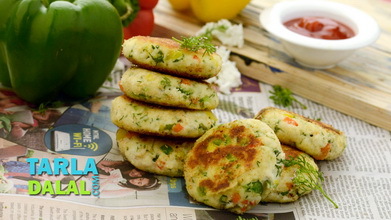 Hara Bhara Kebab (Vegetarian Kebab Recipe) Video. 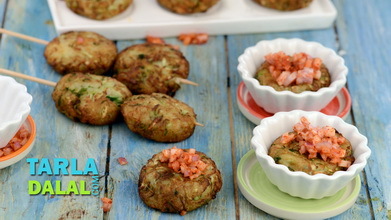 A tried and tested recipe for one of the most popular vegetarian kebabs in the world! 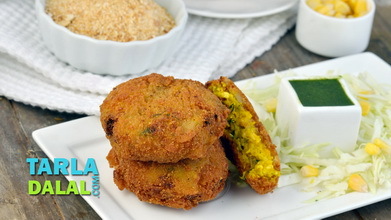 To make hara bhara kabab, clean, wash and soak the chana dal for 1 hour and drain. In a pressure cooker add the chana dal, garlic, ginger, green chilies and ½ cup of water, mix well and pressure cook for 2 whistles. Allow the steam to escape before opening the lid. Drain. 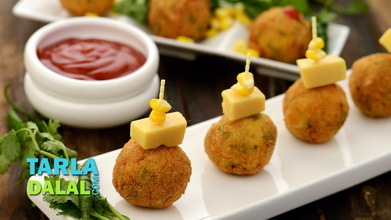 Transfer into a bowl and add the paneer, salt, garam masala, chaat masala and 1/3 cup bread crumbs, mix well. Divide the mixture into 12 equal portions and shape each portion into a 50 mm. (2”) flat kababs. 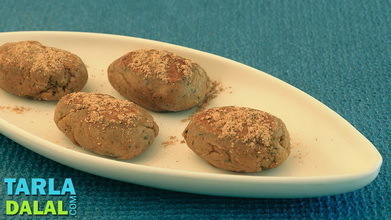 Dip each kabab into the prepared flour- water paste and roll in the remaining bread crumbs. 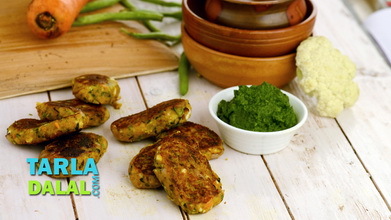 Serve the hara bhara kabab hot with tomato ketchup and green chutney. You can also cook the hara bhara kababs on a greased tava (griddle) by following the same procedure till step 6 and cook until golden brown in colour from both the sides.